François Bocion (1828-1890) was born in Lausanne. He first trained with Christian Gottlieb Steinlen (1779-1847) in Vevey and subsequently with François Bonnet (1811-1894) in Lausanne. In Paris in 1845, Bocion entered the atelier of Louis-Aimé Grosclaude (1784-1869) and later that of Charles Gleyre (1806-1874) and befriended Gustave Courbet (1819-1877) and other important exponents of the Realist movement. Back in Lausanne in 1849 he became a teacher at the Ecole moyenne et industrielle of Lausane, a position he held until his death. At the same time, he had an extensive output with several travels abroad. 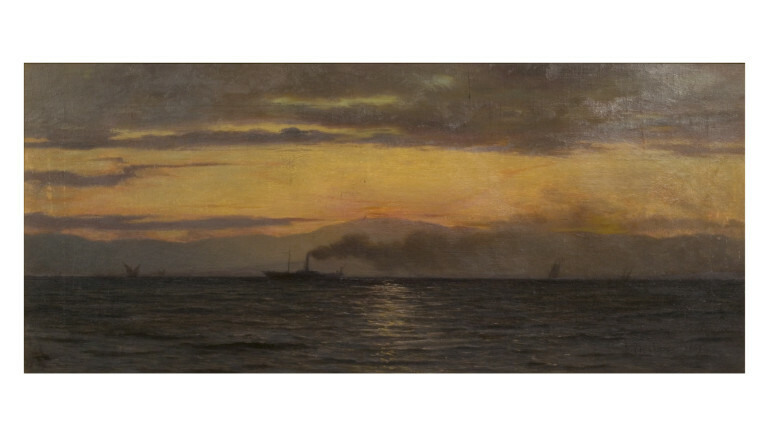 He exhibited in Paris, Vienna, Anvers, London and was a founder member of the Swiss society of watercolorists (1884). This painting was probably executed shortly after Bocion's return to Lausanne and inaugurates one of the main thematic of the artist: lake views. Bocion focused here on the rendering of twilight, especially in the reflects onto the water surface, in a broad albeit restrained brushwork. The attention on atmospheric effect and the direct observation of nature were characteristic of the Realist movement emerged in France in the 1840s. This painting is a fine example of his oeuvre characterised by peaceful scenes dominated by imposing mountains in the distance. View of a lake at twilight with a steamer in the distance and mountains in the background. Rev. Chauncey Hare Townshend, listed in the 1868 post-mortem register of the contents of his villa in Lausanne (V&A R/F MA/1/T1181) as 'Oil on Canvas. Steamer on Lake Geneva: Evening Effect. By F. Bocion. Signed. Swiss. 1863'; bequeathed by Rev. Chauncey Hare Townshend, 1868. Historical significance: This painting is one of a group of 16 paintings bequeathed to the museum by the Rev. Townshend who had a villa in Lausanne where he spent the winter. It is a fine example of the central thematic of lake views in Bocion’s oeuvre. 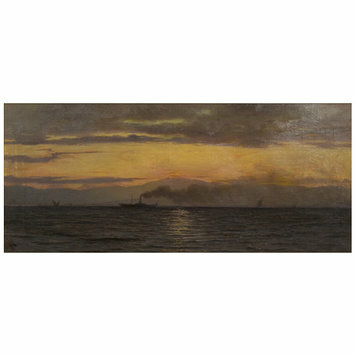 Executed a decade after his return to Lausanne from Paris, this painting witnesses the development of Bocion’s personal stile following the primary influence of the Realist painters such as Courbet and Leon Berthoud. This lake view has been identified as the Lake Leman near Geneva in Switzerland. Particularly interesting here is the horizontal format and the boats depicted in the distance, which marks a difference with previous composition focusing on group of figures on boats in the foreground. Here particularly interesting is the palette composed of hues of blue and purple enlivened by a stripe of golden orange in the sky reflecting on the water surface. Comparable compositions include: Comparable compositions include: Storm on the Leman, Waves Effects and Lake Leman at Twilight, Pointe d’Yvoire , both in Private collection, Lausanne. This painting was probably bought by the Rev. Townshend directly from the artist and displayed in his villa in Lausanne where it completed there a large collection of 19th-century landscapes paintings. The Victoria and Albert Museum owns the most comprehensive group of Bocion’s paintings in the U.K.
Kauffmann, C.M., Catalogue of Foreign Paintings, II. 1800-1900, London: Victoria and Albert Museum, 1973, p. 9, cat. no. 24. Reymondin, M., Catalogue Raisonné de François Bocion, Immerc: Wormer, 1989, no. 415, p. 171.